After the announcement of the operating system called the Firefox OS from Firefox, we were sure that the company is going to pick up some of the smartphone companies to support them, among which there was Huawei as well, recently the company demoed their Huawei Ascend II Y300 at CES running Firefox OS. You can judge by the looks of it that it’s designed to be an affordable smartphone. 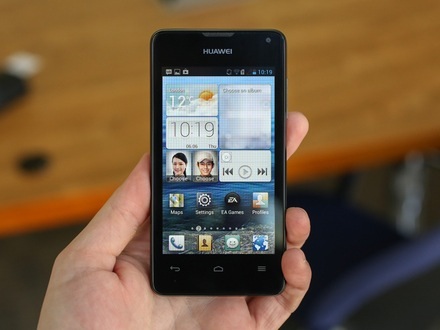 Huawei Ascend II Y300 has some pretty decent specs under the hood. The smartphone has a 4-inch display supporting a resolution of 800 x 480 pixels, 512MB of RAM, 4GB of internal storage and a Qualcomm Snapdragon S4 processor, a 5MP shooter at the back while a 0.3Mp front shooter and a 1730mAh battery which are very low compared to other smartphones out there but Firefox is taking it slow and will go from low end devices to high end. If you are not familiar with Firefox OS then you should know that it is very different from the way Android or iOS runs as Firefox OS runs web apps that are coded in HTML5 and Firefox being famous for its web experience, we are sure that their OS equipped smartphones would have a far better web experience than other operating systems. We have also seen other Firefox OS smartphones from companies like ZTE and Alcatel but companies like that are not that much famous and with Huawei Firefox OS might get a chance to make it through as it’s not easy for a new OS to fit in the market which is already captured by Windows, Android and iOS, but Firefox OS is customizable just like Android and that can be a plus point for the OS. Along with Firefox OS from Firefox Samsung is also trying to push its new OS known as Samsung Tizen into the markets but with much higher rumored specs than any Firefox OS smartphone out there. It’s good to see support from a bigger company for the new OS as Firefox needs it. There were also rumors about Sony joining in the cult but we didn’t get to hear anything from Sony for now. Right now, Huawei Ascend II Y300 is a very big thing in Firefox OS timeline and we have yet to see how it performs in the consumer market.